While advanced warning is provided for approximately 80% of tornadoes before they touch down, nearly 80% of the time that the tornado siren goes off, there is no tornado at all. Such a high rate of false alarms may lead to people ignoring the warnings and tragic consequences when the tornado does touch down and people are not prepared. Dr. McGovern and her students are studying storms from their birth until they die out with the goal of identifying the critical triggers for a tornado. With such triggers identified, false alarms will be reduced significantly. Because data on both the actual tornadoes and the corresponding lifetime of the storm that spawned the tornado is rare, the team is studying tornadoes through high-resolution computer simulations of "supercell" thunderstorms. Supercells are severe thunderstorms with a rotating center and they generate the most violent tornadoes. Using one of the world's most powerful supercomputers, the algorithms developed in this project are generating several hundred computer simulations of these storms. 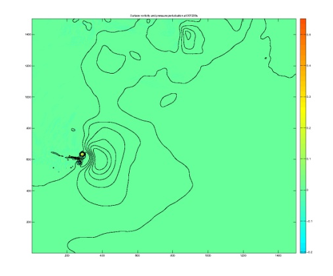 Simultaneously, the teams is also developing novel spatio-temporal data mining techniques that can identify common patterns occurring in a storm 15-30 minutes prior to a tornado. 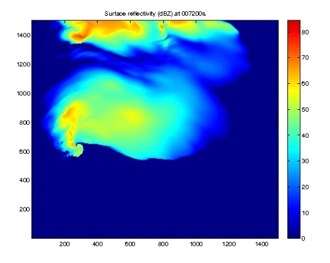 Image #1 shows simulated radar reflectivity of one of the high-resolution simulations. Red regions have more intense precipitation including hail. Blue regions have no precipitation. There is a tornado in the left middle portion of the image, where the reflectivity appears to swirl. Image #2 simultaneously maps the corresponding pressure and an instantaneous measure of spin. The tornado is seen by the small donut of pressure lines with high spin inside it. 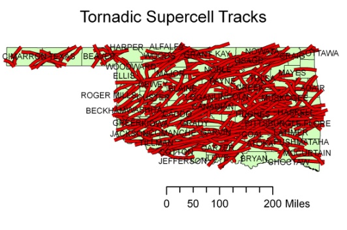 Image #3 shows the track of all supercell storms that generated tornadoes in Oklahoma over a ten year period. 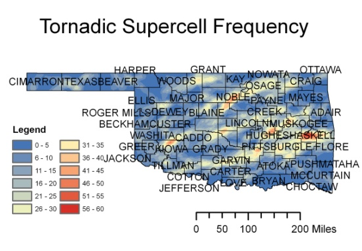 Image #4 shows the frequency of these same tornadic supercells superimposed on a map of Oklahoma where red means tornadic supercells occur more frequently. The research team is studying this data and correlating it with the findings from the simulated storms. This study leads to better understanding and more accurate identification and warning for supercell storms and tornadoes. Not only does this project benefit society through improved prediction of tornadoes, but it brings authentic learning experiences to all levels of Computer Science students.